Sports season call for scrumptious snacks and these chips are so delicious that I can almost guarantee you there will be a bowl of them sitting on my coffee table with a cup of dip close at hand when the football season kicks off. This is a superb, fuss free recipe that I found from Comfort Food Fix by Ellie Krieger and the onion dip is so yummy, it will force you never to buy a bottled dip again. After trying out a few recipes over the course of last couple weeks, this one is my new favorite go-to. And the best part – the chips can be stored in a paper bag for up to 3 days. I thought that the chips were not going to be as crispy as I wanted them but I was glad to be proven wrong. Just slice the potatoes super thin – I used a handheld mandoline but a knife would work just as well. I seasoned the potatoes with salt and paprika, but you can season with whatever spices you like – no restrictions here and the possibilities are endless! You could even use sweet potatoes for a nutrients packed, healthier version. I’ve tried many varieties of store brought baked chips but none came close to as tasty as this. A great find these were. Preheat oven to 400 F. Spray two rimmed baking sheets with nonstick cooking spray. Slice the potatoes super thin, (about 1/16-inch) with a mandoline or a sharp knife and rinse thoroughly under cold water with them placed in a colander. 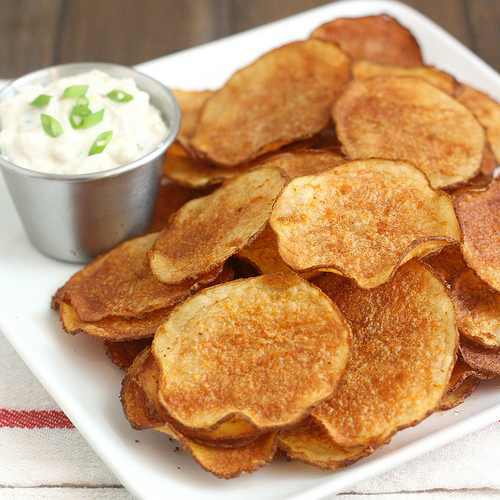 Dry the potato circles completely by placing them on a kitchen or paper towel and cover them with another towel. Whisk the oil, paprika and salt together in a large bowl. Add the potatoes and toss to coat. Transfer the potatoes to the prepared baking sheet and spread in a single layer, making sure there adequate space between them in order to crisp up. Bake for around 12-20 minutes or so until the rounds are crispy and browned. The chips will crisp a bit more as they cool. Do check the chips frequently as the baking time will differ depending on the thickness of the potato rounds. Pull finished chips from the baking sheet and let the others cook till they crisp up. Place a nonstick skillet over medium heat and add the oil. Add in the onions and white parts of the scallions when the oil shimmers and cook for about 10 minutes. Keep stirring frequently until they turn soften and turn golden brown. Cool completely. To the cooled onion mixture, add in the scallion greens, the yogurt, mayonnaise, garlic powder, onion powder, salt, and pepper in a medium bowl and stir until thoroughly mixed . Refrigerate the covered bowl for at least an hour to allow the flavors to infuse. Serve with the chips.